This pair is sitting right at the bottom of its long-term ascending channel visible on the daily time frame. Think the upcoming catalysts could trigger a bounce? The Aussie is in for an eventful week as it faces the RBA decision, quarterly GDP release, retail sales, and trade balance releases while sterling has the U.K. construction and services PMIs to look forward to. Last week, the manufacturing PMI turned out stronger than expected, renewing market confidence that the economy could stay resilient even with Brexit. However, the pound has been in a weak spot since May this year, so there’s a chance that bears might still have the upper hand at this point. Stochastic is already turning higher from the oversold area, though, indicating that bulls are about to put up a fight. If so, GBP/AUD could climb back to the top of the channel around the 1.8000 mark or at least until the mid-channel area of interest at the 1.7000 handle. There are plenty of support areas nearby, so there might be plenty of chances for buyers to defend the floor for the pair. Besides, risk-off vibes could be bearish for the higher-yielding Australian dollar, particularly if tensions with North Korea flare up. Over the weekend, Pyongyang reportedly conducted a successful test of another missile, prompting South Korea to start prepping for potential escalations. I haven’t set actual entry orders yet since I plan on waiting for a bit more bullish momentum before hopping in, probably on a break above the 1.6500 level . I can go for a decent return-on-risk even with a wide stop below the 1.6000 mark since the next upside targets are far off. What do you guys think? It took quite some time and a lot of patience on this one, but it looks like the bullish momentum I’ve been waiting for is finally materializing. 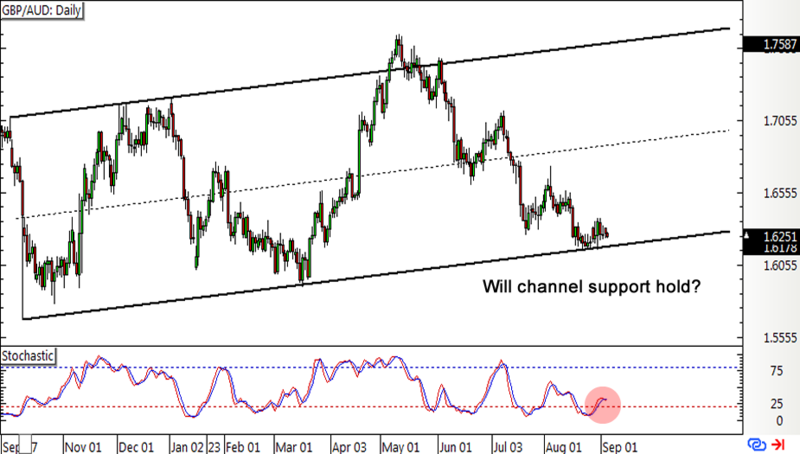 Time to hop in a long GBP/AUD position? Woohoo! Caught a decent win on this long sterling play just ahead of the BOE decision last week, but I can’t help but wonder if I should’ve held on longer.